So the relationship between you & your hair is on the verge of a painful break up. 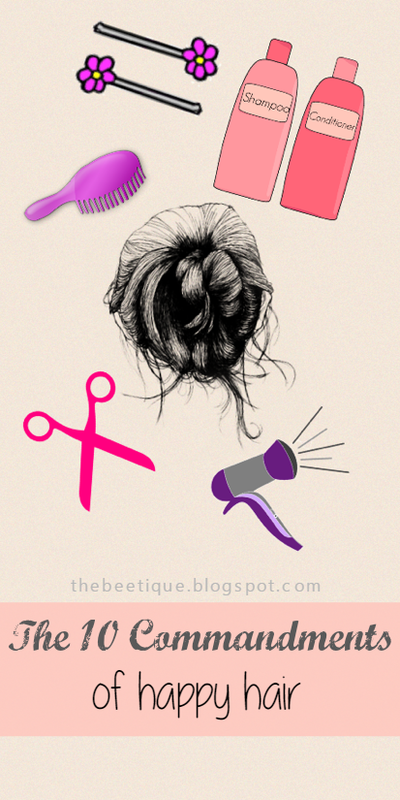 Your hair has a problem with every little thing you want to do, but you'll do anything to try and make it right. who are the only ones with power to bring thee out of the land of hair misery, into the house of hair happiness. for thy hair grows 1/2 inch every four weeks and uncut hair will always break instead of grow. 2-3 shalt thou wash per week; for those days are a Sabbath. Avoid consecutive washing days. that thy days be long in which there is no one to impress. being that pin straight hair prone to greasiness and less voluminous than blowouts. that deserve thy time to grow and strengthen without being bothered, as any baby does. for low heat shalt thou finish job just as well as high heat shouldst. as thy hair absorbs oil products, and oil treatments heal thy strands. or any likeliness of self destroying; thou shalt tie hair back when tempted. then I will master the chic bun for the day instead. then I will rock a headband instead of flatironing them. then I must do a coconut oil treatment before my next wash.
then this must mean I'm due for a cut. then my hair must be left natural & untouched at least once. 1 comment on "The 10 Commandments of Happy Hair"